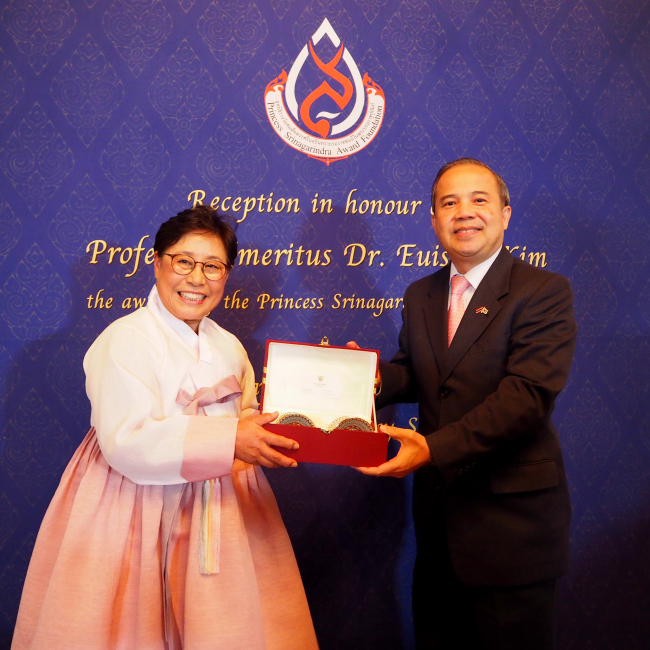 The Royal Thai Embassy in Seoul on April 24 gave recognition to Dr. Kim Eui-sook, professor emeritus at Yonsei University College of Nursing, who received the Princess Srinagarindra Award for her contributions to the nursing profession and public health. Kim received the award, named after late Thai Princess Srinagarindra Mahidol (1900-95), at the Royal Palace in Bangkok in December last year. The honor is conferred annually to individuals or groups of registered nurses and midwives who made significant contributions to public health through direct care, research, education or management. The awardees are annually nominated by national nursing or midwifery authorities or nongovernmental professionals, and selected by the Princess Srinagarindra Award Foundation. “Princess Srinagarindra Mahidol was born in 1900, and graduated from a nursing school in 1916. She won a scholarship to study nursing in the United States in 1917. After returning home, she became a member of Thailand’s Association of Nurses from 1929 and gave royal patronage to the organization that undertook various activities to improve the country’s public health,” said newly appointed Thai Ambassador to Korea Singtong Lapisatepun at the embassy in Seoul. The foundation was established in 2000 in memory of her contributions and to honor individuals who made respectable services to nursing and midwifery, the envoy added. Turning to Dr. Kim, Lapisatepun lauded the professor and practitioner of nursing for her lifelong endeavors, which included founding the Global Korean Nurses Foundation -- an institution dedicated to enhancing Korean nurses’ global engagement -- and helping achieve the United Nations’ Millennium Development Goals and Sustainable Development Goals in public health. In Ethiopia, Ghana, Peru and other developing countries, Kim helped strengthen health care workforces and develop community-based maternal and child care programs. “Dr. Kim Eui-sook has been an exceptional role model of a health care professional both at national and international levels,” said the ambassador. In Thailand, Kim taught local nursing educators and students with her academic knowledge as well as her expertise as health policy adviser to the Korean Ministry of Health and Welfare. Kim is also a board member of the International Council of Nurses that represents more than 16 million nurses worldwide, and was one of the founding members of the World Health Organization’s Collaborating Center for Nursing Development, helping form international primary health care policies. “I involved myself in international activities and chose an early retirement from teaching to work in developing countries around the world. Through these activities, I tried to implement my lifetime of knowledge and experiences to improve poor people’s quality of life,” said Kim, upon the recognition. “The endless endeavors Princess Srinagarindra showed exemplified the true role of a nurse -- identifying needed areas, exploring the best alternatives, activating financial resources, creating networks and pursuing ideas through physical projects with outcome indicators,” according to Kim. The techniques Srinagarindra used in the poor rural communities should be modelled by the world’s health care organizations and industries to combat poverty, Kim said, referring to the princess’s combination of social, environmental and economic developments involving public-private sector partnerships.